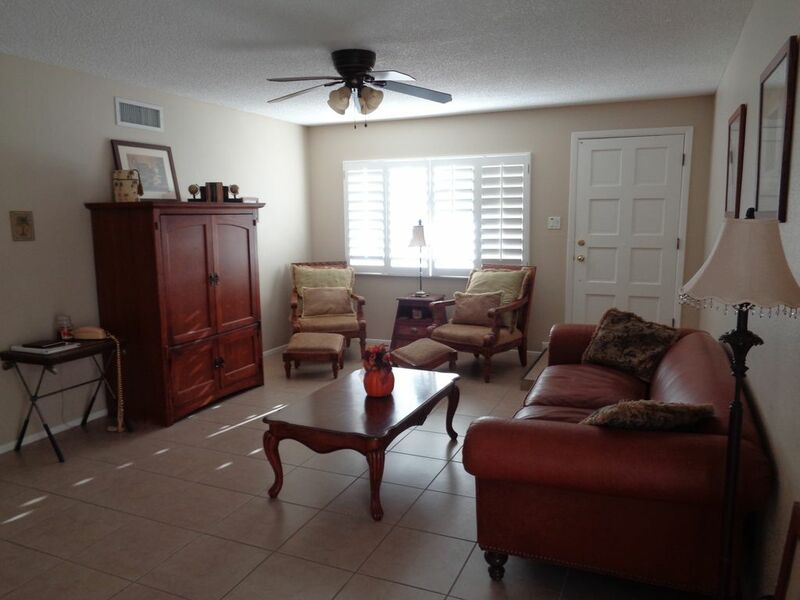 Beautifully furnished, private single story duplex bordering wash.
car garage. Walk to Fountain Park & Downtown. Cruiser bikes provided. Several Golf courses nearby. Shopping & Restaurants within a short 10 min. walking distance.Short drive to Scottsdale & Airport. Library & Community Center 5 min. walk. World Famous Fountain at Fountain Park only 5 min. walk. Splash pad for kids. Playground. Hiking trails across from Park. Designated International Dark Sky Community. Disc Golf Course at Fountain Park. .Fountain Hills Art Festival in November. Fountain Hills Great Fair in February. Barrett Jackson Car Auction & PGA Golf Tournament , in nearby Scottsdale, held in January. Baseball Spring Training within 30 min. drive. McDowell Mountain Park 10 min. drive-Hiking,Mountain Biking & Picnic areas. Saguaro Lake 10 min. drive-Fishing,Boating,Dining. Realtor & resident of Fountain Hills since 1998. We have been hosting visitors in this home since 2006. Super location! Quiet, private setting with mountain views. Pocket door separating bath area from vanity. Fully Furnished Kitchen includes:Full size Fridge, Smooth Top Stove, Built-In Microwave, Dishwasher, Coffeemaker, Blender & Toaster. Flat screen T.V. 's & DVD Player. Stereo & CD player. Bar. Patio Furniture & Gas Grill. Games & Books. Full size Washer & Dryer. Linens provided. I only spent a week in March-April, but wish it could have been more. Great layout and furnishings. Well set up for comfort and ease, very clean -- and easy to keep clean. Cindy was available by phone for any questions or concerns, but completely unobtrusive. Thanks again for a relaxing residence for my visit to the area to see family and friends. I did a lot of visiting and managed to get over to see Roosevelt Lake and down to Tucson. I am recommending this pleasant place to friends. We thoroughly enjoyed our stay here. The property is well situated within the city of Fountain Hills. It is close to the fountain and walking paths but is very private and quiet. The view from the patio is spectacular. Without hesitation, I would stay here again. My husband, myself and our 2 pups had a wonderful stay. The property was perfect and exactly as advertised. The Allens were very helpful and nearby to help with any concerns or questions. The location was awesome. Although our car was handy and parked in the double garage we able to walk to the Fountain park, Starbucks for coffee, lots of different places to eat and even groceries. We also loved the nearby dog park. We would highly recommend to anyone looking for a nicely appointed home in Fountain Hills. The property is very clean and is as described by the owner who is quite responsive if needs arise. The property is well located within walking distance of the fountain, the library and many other community features. Our favorite aspect is the sheltered patio which looks out on to Gun Sight mountain and two washes in which we see birds, rabbits and occasionally coyotes and javelinas. We spend most of our time outside reading and enjoying the great weather. We have spent four, three week vacations there always in April, the time of year when many of the cacti, the Bougainvillea, the palo verde and other plants are in bloom. Quite beautiful. We are already looking forward to April 2015. We look forward to hosting this couple every Spring! Our stay was very nice and relaxing. Just what we needed. Cindy and Dave have thought of everything for this vacation rental. It has a beautiful view and very quiet. A real gem! It is always a pleasure hosting this lovely couple! Hope to see you again! Disc-golf course @ Fountain Park. Cancellation Policy: 100+ days prior to arrival: Deposit refunded- $200.cancellation fee. Less than 100 days prior to arrival : Deposit refunded if dates re-rented - $400 cancellation fee.